If you are looking to explore Las Vegas in a new way, taking a food tour is a great way to discover what the city has to offer. 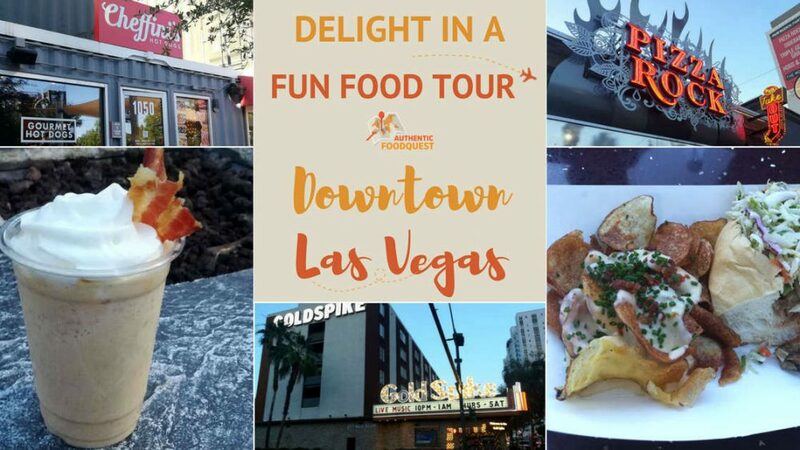 We recently took a downtown Las Vegas food tour with Taste Buzz Food Tours Las Vegas, to discover the local food scene where Vegas first began. Over an entertaining four-hour period, our local guide, Shaun, regaled us with fascinating stories about “Old Las Vegas” as we walked between seven different food stops. With insights from a local guide, join us on this walking food tour and discover downtown Las Vegas through food. Our meeting point and first stop was in Container Park. At the corner of Fremont and 7th Street, Container Park is part of the downtown revitalization project, led by Tony Hsieh, CEO of Zappos. This urban park is made up of more than 40 repurposed, commercial shipping containers of different sizes. In each container, you’ll find a mix of restaurants, bars, retailers and art galleries, all independently and locally owned. 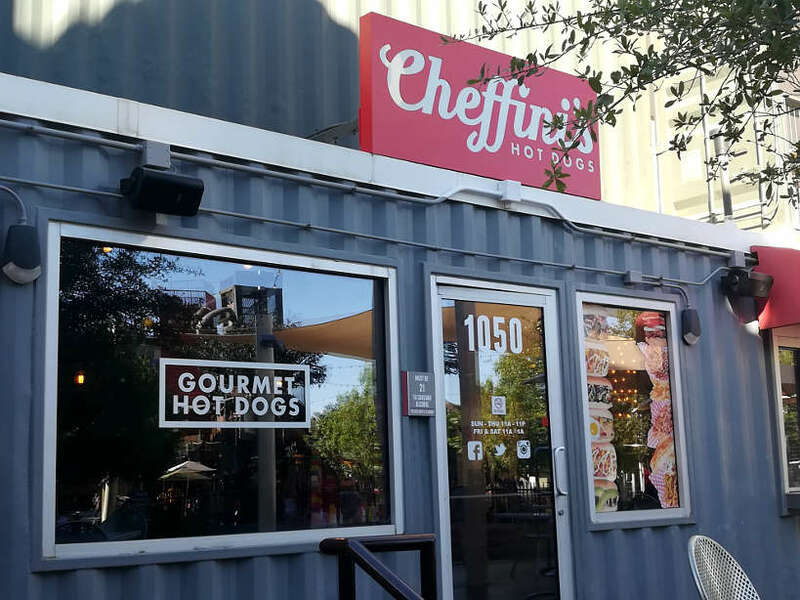 Cheffini’s, our first food stop was one of the first businesses in Container Park. What started out as a humble hot dog cart in 2010, is now a local favorite in the park. Everything is made from scratch, including the vegan hot dogs that delighted the vegans on the food tour. Famous for their unique sauces and toppings, this was a delicious start to the tour. Serving authentic Mexican street food, Pinches Tacos, our second food stop did not disappoint. Described as the best tacos in Las Vegas, you’ll find “Real Mexican food made by Real Mexicans.” Pinches Tacos also has locations in Los Angeles, a city with a fun “Tacolandia” food festival. We cooled off with Mexican Hibiscus Tea along with a street food speciality. 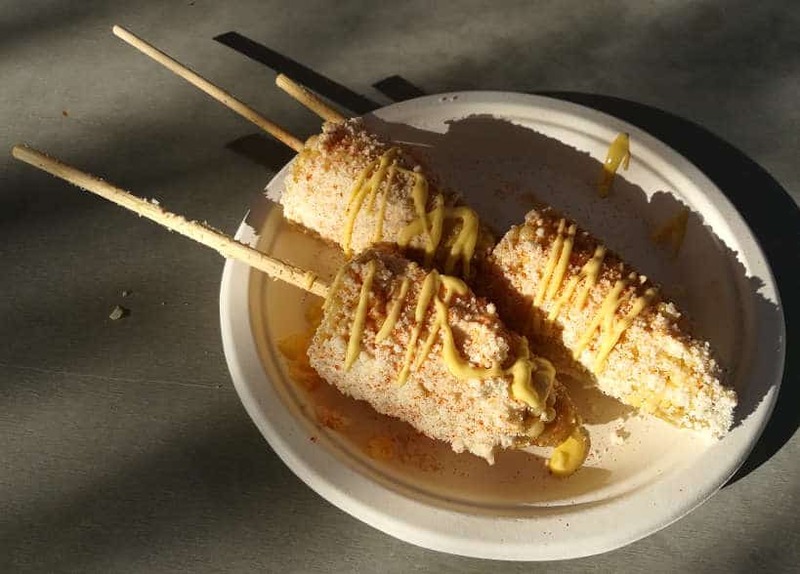 We had Mexican corn on the cob, also called “street corn”, slathered in mayonnaise and cheese. At Pinches Tacos, you’ll find all your favorite Mexican foods including tacos, burritos, soups, enchiladas and more. 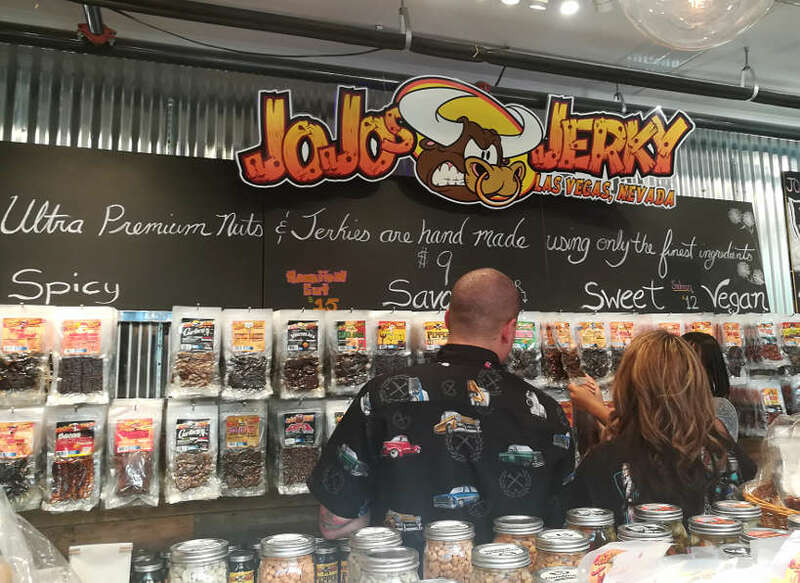 Jerky lovers will delight in the unusual flavors and preservative-free Jojo’s Jerky. At our final stop in Container Park, we sampled a variety of unique jerky flavors such as Hawaiian, Caribbean jerk, wasabi and more. Using only the freshest, all natural ingredients, with no preservatives, Jojo’s Jerky flavors are quite exceptional. In a small 39-square-meter space, it’s impressive to see the variety of jerky flavors, sauces, marinades and nuts, all squished together in a shipping container. Fremont Street is a “must see” in Downtown Las Vegas. From zip lining under the Vegas sky to listening to live concerts, there is enough to keep you entertained day or night. Food experiences are also part of the fun. Starting at the Heart Attack Grill, where the customers have to wear a hospital gown, and the waiters and waitresses are nurses. Be warned, as our guide Shaun told us, if you don’t finish your plate, you get spanked! The Golden Nugget Casino, the largest casino downtown Vegas, is at the epicenter of the pedestrian section of Fremont Street. We walked in without any expectations only to discover another world of entertainment. Looking to swim with the sharks? Further inside the casino, you’ll find an extravagant shark tank swimming pool. You don’t have to be a guest to experience the pool. You can get a $25 all-day pass and get close to full grown sharks. 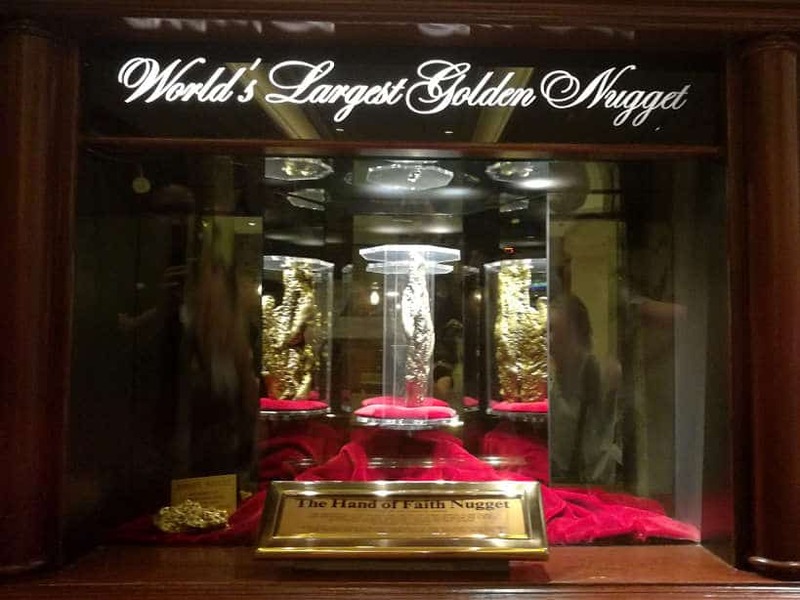 One of the particularities of this casino is the showcase of the second largest gold nugget, called the Hand of Faith, due to its shape. The funny part is that the piece of gold is not from Las Vegas but from Australia. This round of entertainment while walking, was enough to wet our appetite. 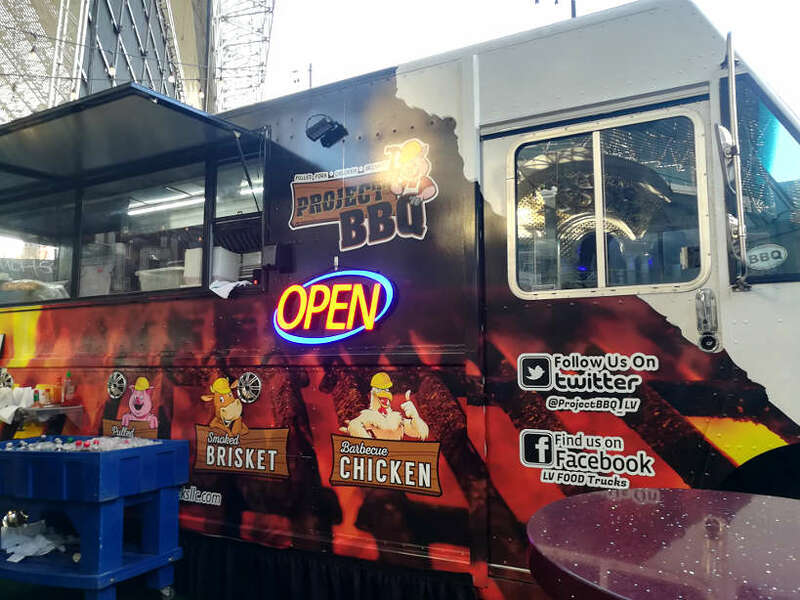 In the middle of the pedestrian only Fremont Street, we stopped at Project BBQ Las Vegas food truck. Using high quality ingredients, this local spot started with the simple idea of offering a great BBQ experience in the desert. BBQ sandwiches are served with your choice of delicious beef brisket or pulled chicken or pork. They are served with a side of homemade potato chips and coleslaw. The meat is seasoned with a unique tasty sauce made with beer and cheese. The barbecue sandwiches were delicious. 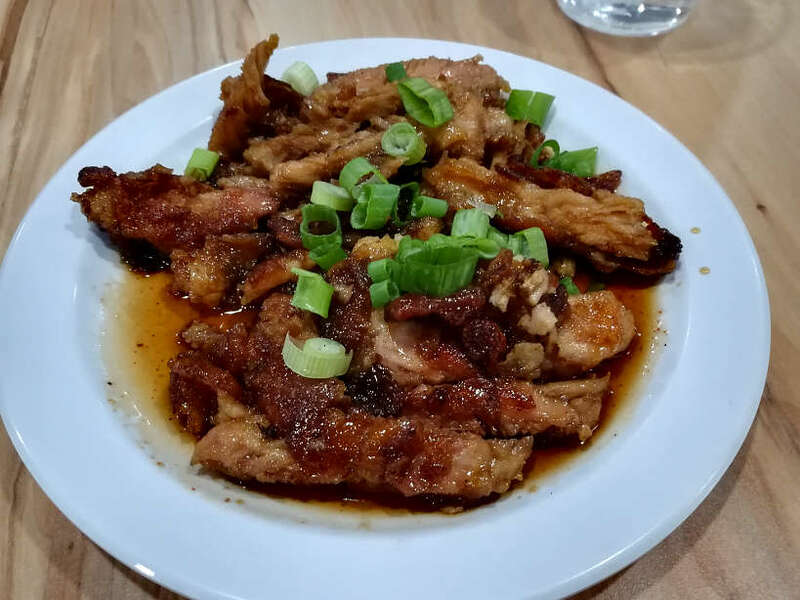 Filled with extra tender and juicy meat as well as fresh and crispy chips. An excellent snack on Fremont Street. To walk off our last food stop, we left Fremont Street and made our way toward the local casinos, away from the main tourist attractions. Walking into Main Street Casino Brewery Hotel is like taking a walk down memory lane. With a beautiful art deco interior, this casino features amazing art inside. It is said that Bob Snow who owned the hotel in 1991 put $82 million of his own money to renovate the hotel and acquire a large collection of antiques, antiquities and relics. Within a year he went bankrupt and had to sell the hotel including his large collection of antiques. Throughout the entire hotel, you’ll see items from the collection and pieces of history. The most surprising is the entire portion of the Berlin Wall located in the men’s restroom. As weird as it sounds, it actually has urinals affixed to it. Navigating us through the casinos, Shaun, our guide, got us special permission to see the Berlin Wall in person, ladies included! Las Vegas is referred as the 9th Hawaiian island. The Hawaiian population is huge in Las Vegas, when many left their distressed home state in the 1990s to find jobs and more affordable living in Las Vegas. Hotel California seized the opportunity to bring Hawaiians to their hotel by making you feel like you are in Hawaii as soon as you walk in. It’s no surprise that Hotel California is known as the ‘Hawaiian home away from home’. Aloha Specialties carries on the Hawaiian tradition offering traditional Hawaiian cuisine at California Hotel or “The Cal”. Conveniently located on the second floor of the Cal, you’ll find the restaurant bustling with “local” Hawaiians. To taste the local Hawaiian fare, we had spam musubi. 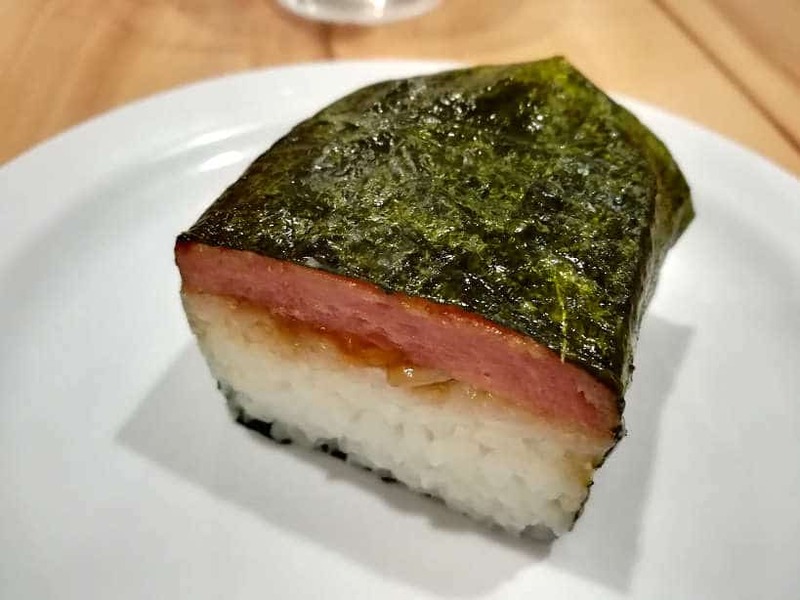 It is a sushi-style spam meat over rice wrapped in seaweed. This surprising snack is very popular in Hawaii and a favorite at Aloha Specialties. To round up our Hawaiian food stop, we were also served a delicious Hawaiian-style marinated chicken. The chicken was cooked in chicken broth, ginger and green onions. The sauce was tantalizing and had us energized to walk some more. After leaving the casinos, we made our way to the two last food stops on the tour. Featuring gourmet pizzas and an energetic vibe, this extremely popular local favorite is said to make the best pizza in downtown Las Vegas. One of the owners, Tony Gemignani is a 12-time World Pizza Champion. The restaurant has four ovens and makes a variety of different kinds of pizza styles. From New York, to Chicago Deep Dish and even gluten-free options of your favorite pizza style. Seated outdoors, we enjoyed a slice of creative pizza made with purple potatoes. The pizza was surprisingly tasty with unique flavors that perfectly complemented each other. After this tasting, we were left wanting more. 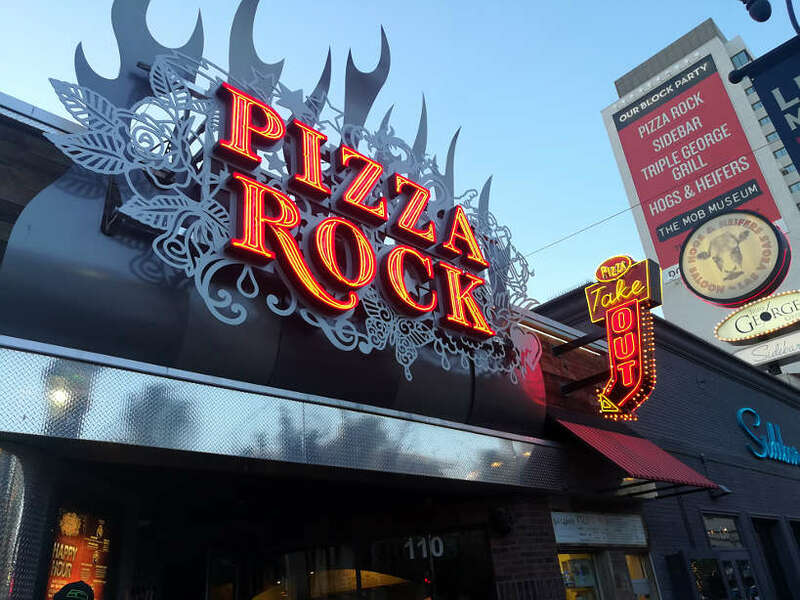 Pizza Rock is crave-worthy pizza and a highlight on the food tour. What was once a hotel-casino with cheap rooms and rows of slot machines has now been transformed into a cool and trendy adult playground. 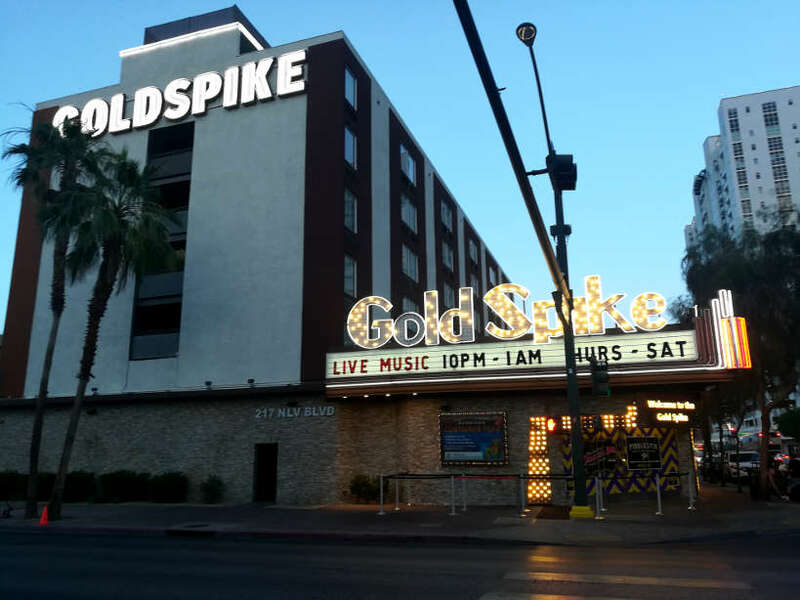 For our final stop on the food tour, the Gold Spike was the most visible demonstration of the downtown Las Vegas revitalization effort. Owned by Tony Hsieh, Gold Spike Hotel & Casino is now an adult playground, frequented by Zappos staff. Find a variety of games including giant chess board, Twister, giant Jenga and more. One of the best parts is that it is non-smoking and on certain nights, live DJ’s perform in the outdoor backyard. From the restaurant, Fiddlestix, we ended the food tour with one of the most unusual desserts. 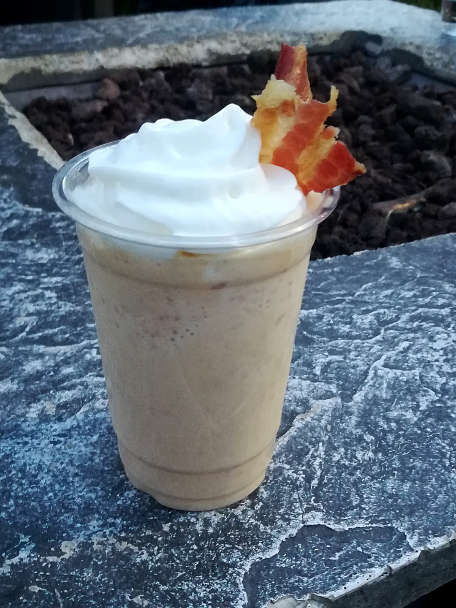 We had an Irish Breakfast Milkshake made with Jameson Irish whisky, crispy crepe crumbles, maple syrup, whipped cream and a strip of crispy bacon on the side. This heavy and intensely sweet treat was the perfect ending to a fun and entertaining Taste Buzz Tour Downtown Delights Foodie Tour. Touring downtown Las Vegas is a must-do while in Vegas. With Taste Buzz Food Tours, you’ll learn about the history of the city in a fun and entertaining way. You also discover the best kept secrets of Vegas that only the locals know. 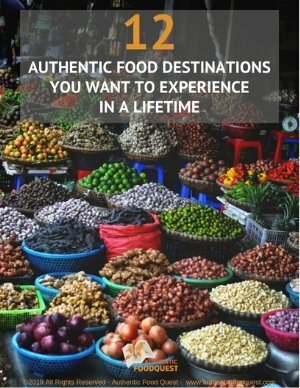 Add unique food stops and surprising bites of local flavors, and you’ll have one of the most fun and enjoyable food tour experiences. Created by a Las Vegas native, Taste Buzz Food Tours offers a variety of unique food tour experiences in Las Vegas. Choose from three different types of tours. You can take a downtown foodie tour, choose a food tour of the Las Vegas Strip, or dine like the stars at the trendiest and most exciting restaurants on the strip. What makes Taste Buzz Food Tours so unique is that you can count on an entertaining experience with tour guides who make you feel like “your friends” in Las Vegas. 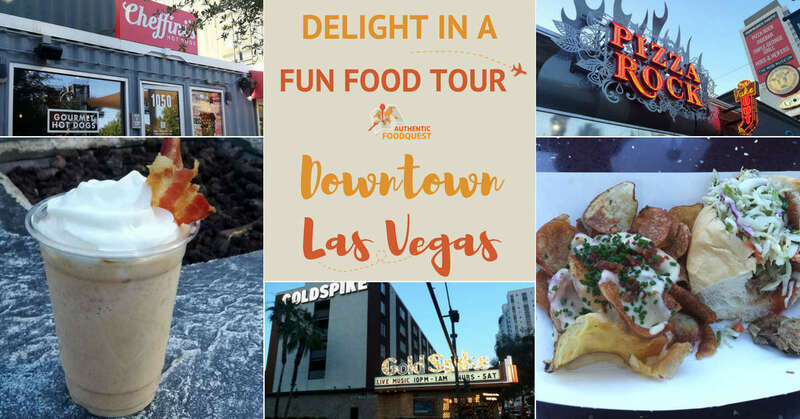 Discover downtown Las Vegas, when you click here to book your tour: Downtown Las Vegas Food Tour. Special thanks to Taste Buzz Food Tours for having us on this tour. All views and opinions expressed are our own. Full bellies and happy taste buds too! Stay close to all the action in downtown Las Vegas when you book a stay at any of the following historic downtown Vegas hotels. Golden Nugget Hotel & Casino In the heart of Fremont Street, Golden Nugget is known for its large rooms and the Shark Tank pool experience. It also offers a large breakfast buffet and eight restaurants on site for premium steaks, seafood and elegant decor. California Hotel & Casino – Located just two blocks away from the Fremont Street Experience, “the Cal” welcomes you with the hospitality of the Hawaiian Islands. Enjoy the Islands fare at Aloha Specialties and enjoy easy access to the Fremont Street Experience. Don’t miss the Market Street Cafe for the legendary “oxtail soup”, a secret Island hangover cure. Yes Vegas offers more than gambling 🙂 A food tour is a must on your next US trip. Hmmmm, cheese on all your food in the U.S.? What did you eat, besides burgers and pizza that might have had so much cheese? Let us know. Love taking food tours when we can, done a few in Istanbul, Ljubljana and Amsterdam. This tour sounds interesting for 2 items for me – the mexican food and the delicious barbeque sandwiches (sauce with beer and cheese…very interesting!). That’s wonderful to read that you love taking food tours. They are such a delightful way to discover a city. 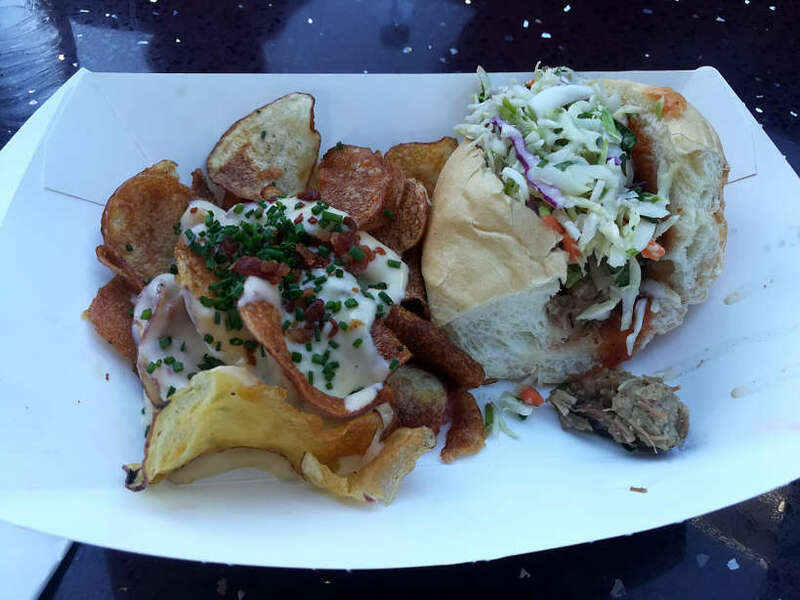 Do consider a downtown Las Vegas foodie tour on your next trip to the U.S. Thanks for stopping by. I would have never imagined going for a food tour in Vegas to be honest but this one looks pretty awesome. 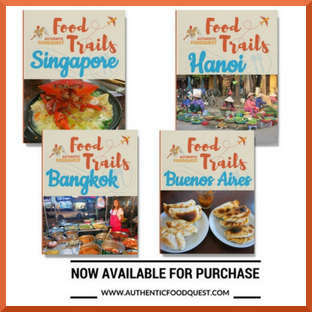 What can a better way of tasting local authentic food than a food tour and for a foodie like me, it should be a no-brainer! I love that they have included Mexican food in the tour, I love tacos and nachos and fresh guac! Also, the Irish Breakfast Milkshake made with Jameson Irish whisky at Golden Spike Hotel & Casino sounds like a perfect thing to try! This downtown foodie tour of Las Vegas is really a unique way to discover the city. The food stops are all unique and they each showcase something unique about the local food culture. The breakfast milkshake was quite surprising!! I would never have though to do a food tour in Las Vegas. But it is a great option for us as non-gamblers. It was interesting to see that the first stop was for hot dogs. Freemont Street is such an iconic spot to visit. Especially with a stop at the Heart Attack Grill. I would eat it all so I didn’t get spanked. We will definitely consider a food tour on our next Vegas visit. We are non-gamblers as well and taking a food tour is a perfect way to see more of the city. The stops are iconic and rich in history. Do certainly consider a downtown foodie tour with Taste Buzz Food Tours on your next visit to Vegas. Thanks Linda. 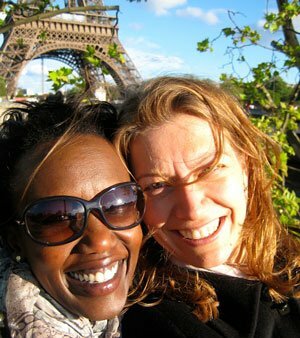 Over the years we have traveled to many destinations, but would you believe we have never been on a food tour? After reading this, I am convinced we should definitely do one. I would love to check out the folks at Hawaiian Food and try a pizza or two at Pizza Rock. That’s incredible that you haven’t been on a food tour yet. You’ve got to give it a try. It will change the way you travel 🙂 In Vegas, you’ll not go wrong with a downtown foodie tour. The Hawaiian food and Pizza Rock are great stops on the food tour. 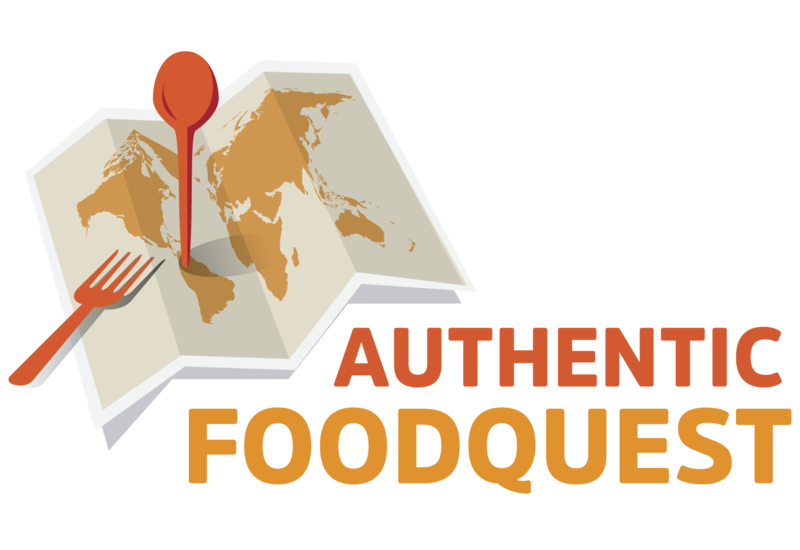 Do let us know where you end up taking your first food tour. Cheers. I love a food tour and this one in Las Vegas looks so good! Such a variety of food to try and really unique places to visit, not what I was expecting to read. Las Vegas is still on my list to visit and now I know there is more to it than just the big hotels and casinos I want to go more! Awesome to read that Las Vegas is on your list of top cities to visit. There is truly a lot to do and exploring downtown with a foodie tour is highly recommended. Let us know if you have any questions as you prepare for your future trip. Thanks, Lucy! Food tours are my fav as they give the right dose of culture and history of the place. It speaks volume on the evolution of the city. Wow, container park looks a noble idea. I love tacos and would love to try Pinches tacos someday if at all they serve something vegan. I am curious to know if a vegetarian like me can survive there. Thanks Himanshu, and we agree taking a food tour is a great way to explore a city. Actually on this particular food tour, we had a couple of vegetarians with us. And yes, they were still able to participate and enjoy the experience as well. Don’t let being a vegetarian “stop” you from taking a food tour 🙂 Cheers. I was just in Vegas a few weeks ago and sadly missed all of these spots! Time for a return trip so that I can fit in this food tour. I mean, how can I pass up that street corn?! You are right, it’s time to head back to Vegas for more downtown Foodie delights with a Taste Buzz food tour. Not only is the corn delicious, it is also a local specialty in Mexico. Discover a new side of Vegas with a downtown foodie tour 🙂 Cheers. I didn’t realise food tour is a big thing in Vegas, I love the idea of repurpose containers and turned into a small community and the historical side too a piece of Berlin wall! I’m not a massive fan of gambling ( casino) but these alternative activities sounds fun! There are many more activities beyond gambling and casinos in Las Vegas. We are also not gambling fans so the food tour is a great way to discover the city and enjoy the local Vegas foods. Highly recommend a Taste Buzz tour on your next trip to Las Vegas. I only had a brief visit to Vegas, and I never made it off the Strip. It looks like I missed out on a ton of great food. These dining options look way better than what I was seeing in the more heavily-trafficked area I was in. Getting off the strip is a great way to “eat what the locals eat” and prices more affordable than on the strip. Keep a Taste Buzz Food Tour in mind for your next Vegas trip. You’ll be delighted!! I have never tried Hawaiian food. It looks like Japanese food. One day I will try it definitely. Ok a) this post made me really hungry and b) I have been to Vegas a few times but doing something like this never entered my mind! I am a vegetarian so it might be a bit rough in terms of not a lot of choices but the vegan hot dog, now that I could do! It seemed like a lot of heavy food but sometimes that is my favourite and you got a lot of walking in so that would help! I do have a sweet tooth and minus the bacon, the shake at the end looked AMAZING. Thanks for sharing this information! You’ll be surprised by the number of vegan and vegetarian options in Las Vegas. 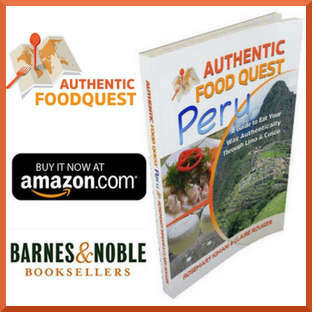 Taste Buzz Food Tours can certainly adapt the options for those with special dietary needs. Simply let them know when you make a booking. The walking and seeing the historical sites does help prevent from feeling stuffed. Glad you enjoyed the article. I’ve been to Vegas once and absolutely loved the place! I’m planning on going back soon and was looking for something to do that wasn’t just drinking or gambling. Thanks to your post I now know I can eat too!!! Also it’s so cool to hear that the vegans on your tour were happy with the choices too – those hot dogs sound incredible! Awesome to hear and that’s part of our goal with this article. We want to share all the foodie activities that are available outside of gambling. Do consider a Taste Buzz Food Tour on your next trip to Vegas. You will be delighted!! Getting off the strip and seeing “old” Las Vegas is half the fun. A Taste Buzz Food tour is not only fun, it is also a delicious way to see what the city has to offer. Something for your next trip to Sin City!! 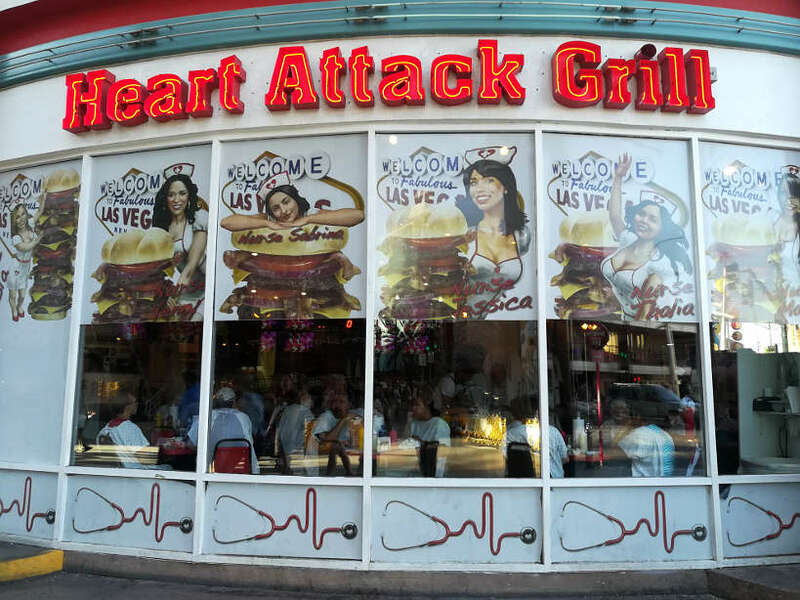 Vegas doesnt do things by half measures thats for sure – ‘heart attack grill’!! Your taste buds must have been on fire for this tour. A great idea for non gamblers. Thanks for sharing. This is such a different way to see Vegas, and a different side to Vegas too. Who knew that there were so many restaurant options off ‘the Strip’. I’ve only been once and it’s hard for me to see Vegas as anything other than bright lights, but my fiance wants to visit so if we do I will definitely be exploring more of downtown Vegas. The Taste Buzz Food Tour is definitely something I could get my teeth into. That’s great to hear Aimee. Exploring downtown Las Vegas is a great way to see another side of the city. Eating at local restaurants and learning about the local history is the perfect combination. Definitively recommend the tour highly. Thanks for stopping by. I had no idea there were food tours in Vegas! I’m leaving in a few days for Turkey and was just researching food tours in Istanbul. It’s remarkable that I’ve never done one. My hubby would be so down for the jerky and bbq stops. 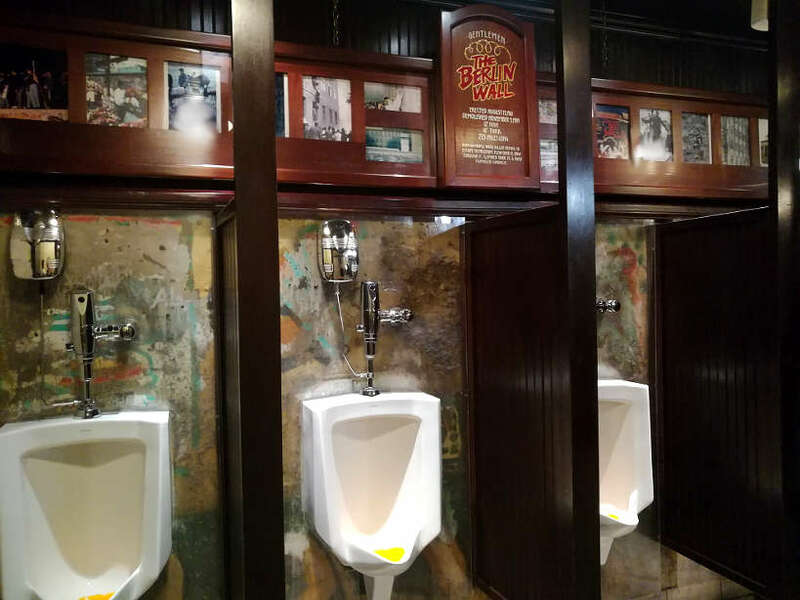 Those urinals with Berline wall are a hoot! 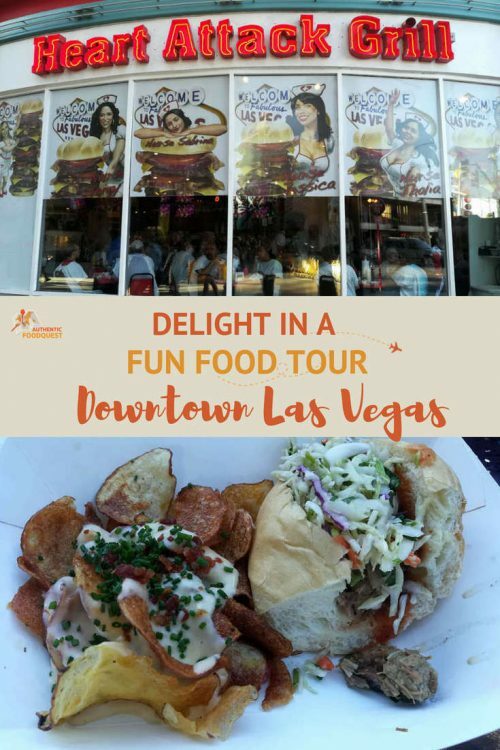 Vegas has so much to offer and the food tour is a great way to see a different part of town as well as learn the history of the city. This sounds like the perfect tour for both you and your husband. Highly recommend it for your next trip to Sin City. Thanks for stopping by Melissa. This food tour in Las Vegas with Taste Buzz Food Tours sounds amazing. 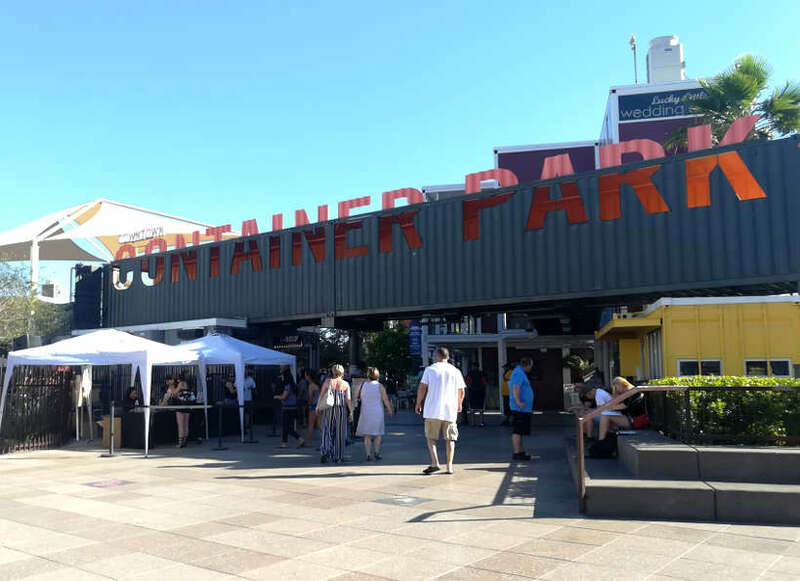 I am loving the idea of the Container Park with over 40 restaurants/bars/cafes to experience. Also a nice cup of Mexican Hibiscus Tea at Pinches Tacos sounds amazing. 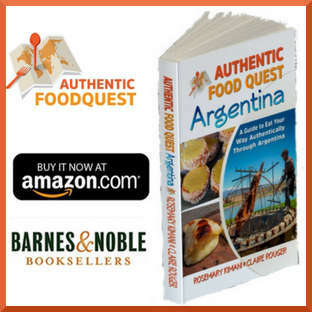 I do love food tours – I think it’s a fantastic way to explore a place. Thanks so much Soraya. You’d really enjoy a food tour with Taste Buzz Tours. Definitively highly recommend taking on on your next travels to Las Vegas. Thanks for stopping by.